What if you wanted only certain rows (i.e. rows of a particular type) to be only replicated to particular slave db ? and you were not interested in the rest. We have different types of invoices like – accounting invoices , warehouse invoices , procurement invoices. One Solution: Use tables with BlackHole (Black Hole engine). Create another table with same schema as invoices but having engine as BLACKHOLE. 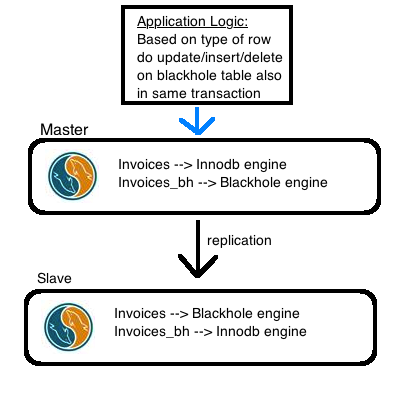 What about Transactions across Blackhole and innodb ? Ans: In our case, if a rollback is issued , the transaction is not written to binlog => so no worries. Thank you for reading this post !! Well in 2011, for a week we would see disruptions in our ERP servers especially around 7pm. We had a ‘job’ table & multiple app servers(cluster) inserting jobs and also picking them up. At around 7pm , we would notice that the number of Pending jobs would increase dramatically i.e. app servers would not execute them. The ‘confirm shipment’ job – a critical job for us would not be executed – leaving the fate of many shipments hanging in limbo. It was a fight between Inserts & Updates on an index. Since the update is confined to a particular row – the index lock can be granted to both the insert and the update. Also please note: multiple servers exist – they all do the same thing i.e. insert job and update job. As i have mentioned in the about page of this blog – MySQL is not just some piece of code, it too has a SOUL. Well it has a mood too. it too can SING. This was my Hack Day idea @ flipkart for which we won coolest hack day award. Apart from the singing, the basic intention was to provide an solution to enable general query log without causing system failure i.e. as the general query log when enabled could eat up disk space fast. Will be putting up the code shortly. I would like to thank Ramakrishna Nalam , Shashwat Agarwal , Suthirta for inspiring me to take up this new Blog. I am chief Surgeon at the Flipkart M*A*S*H – which is an internal blog , well MASH 213 is now here. At work, we had a use case for MultiSource Replication . We were using Tungsten to achieve this. We were stuck on a case where fail over would occur – i.e. what would happen if a slave we were replicating from would die, how would we continue using another slave ? Using MySQL 5.5 – Well, the hard way would be to parse binlog – find the location of last applied transaction in other slave binlog, get its position and continue from there – the format of binlog – statement/ row/ mixed had to be same across all slaves else this could be tough. why not replicate from relay log of slave instead of its binlog – All slaves would have similar Relay Logs. Since tungsten would replicate from the relay log of the new slave now & the new slave relay log and the failed slave are same, the new slave would have that XID in its relay log , we could now narrow down to the corresponding position and continue replication from there from this slave. We could even start replicating from the Master Binlog – (i.e. now ask tungsten to feed of binlog instead of relay log) and when the slave is up, we could make tungsten switch to relay log of slave. Do visit the code – This is my first patch to MySQL 🙂 – though not included in oracle/percona source tree. All in all – my first surgery at this Unit.